Home › Learning Center › What Is Gastro-Esophageal Reflux Disease And How Is It Treated? Gastro-esophageal reflux disease (GERD) is a common illness affecting up to 10% of infants. It must be clearly differentiated from normal reflux (GER) which is a physiological neuro-muscular immaturity of the coordination of the muscle opening and closing the stomach. This state is very common and stops by itself without treatment by the end of the first year of life. It is caused by a weakness in the muscular valve at the top of the stomach leading to regurgitation of stomach contents upwards into the esophagus. GERD is usually noticed before 8 weeks of age and most commonly presents with effortless vomiting of large volumes of milk after feeds. It can also present with feeding difficulties, failure to gain weight and pain. Sometimes if the refluxing liquids enter the trachea it can cause persistent coughs, recurrent ear infections, apnoea, choking and even pneumonia. GERD is more common in children who were premature, have a hiatus hernia, have had surgery on the stomach, have a family history of GERD or have a neuromuscular disability. In older children obesity can be a contributing factor as can dietary intake of fatty, spicy or acidic foods. Most children will improve by the time they reach the age of one year as the valve becomes stronger and they spend much more time upright, but it can persist in 10% of sufferers. Treatment begins with thickening the feed with either specially designed formulas or cereal additives to make it harder for the stomach contents to regurgitate. You may also be prescribed alginates such as Gaviscon, which form a raft on top of the stomach contents to reduce regurgitation, this can be added to formula or expressed breast milk. If this fails there are medications that block stomach acid production (H2 blockers and proton pump inhibitors) and ultimately surgery. Feeding tubes are not commonly used in treatment of GERD but your physician may recommend one either if medication is not settling symptoms or if the child is failing to thrive. A history of GERD may also lead to persistent food refusal later on and a requirement for tube feeding as a way of getting adequate nutrition. A feeding tube may help reduce the symptoms of GERD due to feed being introduced slowly and the stomach not filling as much, however it more commonly produces more reflux. 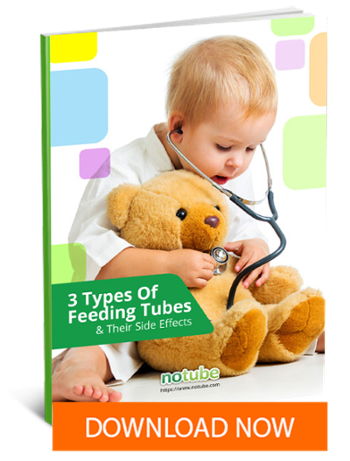 The main aim of tube feeding is to provide enough nutrients for the child to grow. There are some disadvantages to tube feeding. Naso-gastric tubes can increase the risk of aspiration where stomach contents get into the lungs (although most studies of this are based in critical care rather than active infants) and any form of tube feeding can cause diarrhoea, high blood sugar and high blood phosphate levels. There is also a high risk of delayed return to oral feeding.